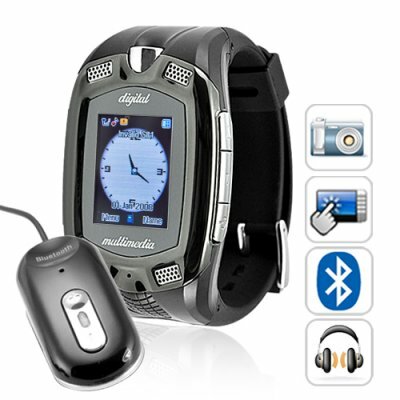 Successfully Added Super Cool Mobile Phone Wrist Watch to your Shopping Cart. Super Cool Mobile Phone Wrist Watch. Tri-band (900MHz, 1800MHz, 1900MHz) Super Cool Mobile Phone Wrist Watch. This is a fully functional unlocked GSM mobile phone with a color touchscreen, built in microphone and speakers, Bluetooth, and multimedia functions. This is the latest in a great line of China mobile phone watches to be released this year, and unlike any others, features a digital camera/video camera built in! What could be better than calling friends from your wristwatch? With any GSM SIM card inserted, this inconspicuous digital watch becomes a fully featured power house of a cellphone, with Bluetooth, wireless MP3 listening, camera and personal organizer. Calls are simple too with the supplied Bluetooth headset, or by using the watches built in microphone and speakers. Easy charging is achieved via USB, as is data transfer. The watch itself features a durable rubber blend strap, gun metal gloss surround and chrome detailing. With all of the features of a modern mobile phone slapped on your wrist you'll never have to worry about forgetting to carry your phone, and you'll lighten the load, and provide a unique talking point for your friends. Level up in the world of technology with this great product available to you from Chinavasion at great wholesale prices . A surefire profitable resale item, start selling today and use our excellent drop shipping service to maximize your limited resource of time. NOTE: This product is compatible with GSM at 900MHz, 1800MHz, 1900MHz. Please check with your service provider if you are unsure of your local GSM frequency. Do you think this would be a good product to resell to others? We suggest you visit our article titled "eBay Alternatives - Where Else Can You Sell? " (URL = http://www.chinavasion.com/ebay_alternatives.html) to get an idea of where online you can resell this item. Is this watch like the Hammacher Schlemmer Touchscreen Cell Phone Watch? It is identical, except this one costs less (wholesale prices) and was introduced a year before the Hammacher Schlemmer. How do I pair the Bluetooth Headset with the mobile phone wrist watch? On the lead of the Bluetooth headset you need to press and hold on the button located on the MIC piece. When the headset is switched on you need to continue to hold the button until you start to see rapid flashes of red and blue constantly appearing. It is at this stage that you should type in the 4 digit pass code that is provided in the user manual, if you wait too long to enter the pass code, then the Bluetooth headset will revert to flashing between blue and red, slower than before and you would have missed the window of opportunity to pair the wrist watch with the Bluetooth headset. Remember to to keep pressing on the Button on the Bluetooth head piece next to the MIC, until rapid flashes of blue and red appear, then enter the 4 digit pass code, and your wrist watch should pair with the Bluetooth head set. Can I use this phone in Canada or the United States? Yes, this can work with network providers having 1900MHz band support. However, there may be gaps in your network coverage. You should review the map of your network provider to see if 1900MHz is available in your part of the country. It is weatherproof in that you can wear it outdoors just like any normal wrist watch, but you should not wear it while swimming, taking showers, etc. i just received mine is really awesome thanks chinavasion. My son loves it very much! on 2010-03-19 19:51:45 This is a great product.Five star for this product. chinavasion company to every one.